In SERENITY, Oscar winner Matthew McConaughey plays Baker Dill, a hard-living, hard-drinking, hard-loving, grizzled a fishing boat owner in Plymouth, off of the Florida Keys. With the assistance from Duke (two-time Oscar nominee Djimon Hounsou), they cater to tourists renting the boat to hook huge fish but mostly pass out drinking lots of beer. Back on dry land, Dill is in a mutually-satisfying, no- strings-attached relationship with Constance (Oscar nominee Diane Lane) when he’s not writing copious notes trying to rein-in a giant tuna named Justice, guzzling rum like a pirate on a bender at the island’s only bar. Dill is obsessive and flat-out broke, unsure how he can stay afloat. Then one faithful day, his ex-wife and the mother to his teenage son, Karen, walks into the bar. As played by Oscar winner Anne Hathaway, she is a statuesque blonde with a Veronica Lake hairdo, mostly hiding one eye and she’s in Plymouth to ask Dill a big favour. Would he kill her abusive billionaire husband Frank (Jason Clarke) for 10 million dollars? I am a huge fan of classic Film Noir movies from the 1940s and give props to Oscar-nominated Writer/Director Steven Knight for attempting to recapture that feel, versus going the more common Thriller route. He doesn’t succeed so much as his dialogue lacks the zing and offbeat humour of a Raymond Chandler, James M. Cain or Dashiell Hammett story. Despite helming the great Tom Hardy flick “Locke”, SERENITY needed Knight to channel his inner Billy Wilder. Whereas the Script is clunky and at times unintentionally-funny, I appreciated what he tried to do. And despite there being minimal chemistry between McConaughey and Hathaway due to what their characters are forced to say, their love scenes are erotically-charged. Where SERENITY shines brightly is that its visuals are stunning. Cinematographer Jess Hall’s eye is riveting with luscious scenes and stunning vistas galore. It is the most hypnotizing movie thus far in 2019! It’s time to address the elephant in the room. The Plot Twist near the very end of SERENITY. It is so ludicrous and unbelievable (there were walk-outs at the screening I attended when it was revealed), it belies whatever intent Steven Knight had hoped to attain. It is so far out of left-field, I maybe gained a new respect for M Night Shyamalan. All that said, I have a healthy admiration for noble failures of which SERENITY is one. Diane Lane shows great restraints; a polar opposite to the effective scene-chewing Jason Clarke. 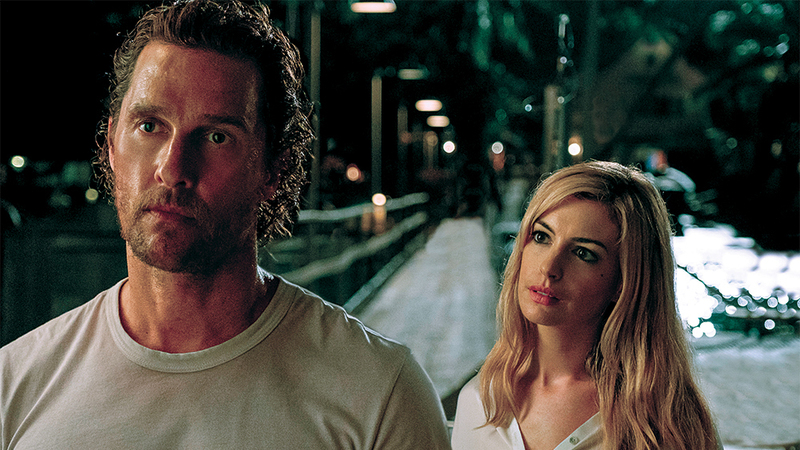 Anne Hathaway is a stunning blonde and there is still no one his age in Hollywood who could fill a wet white clinging tee-shirt better than McConaughey. I will definitely watch SERENITY again. Elevation Pictures release SERENITY Friday, January 25, 2019.